This article was published by the author in the Vaccari Magazine n 44 of November 2010. 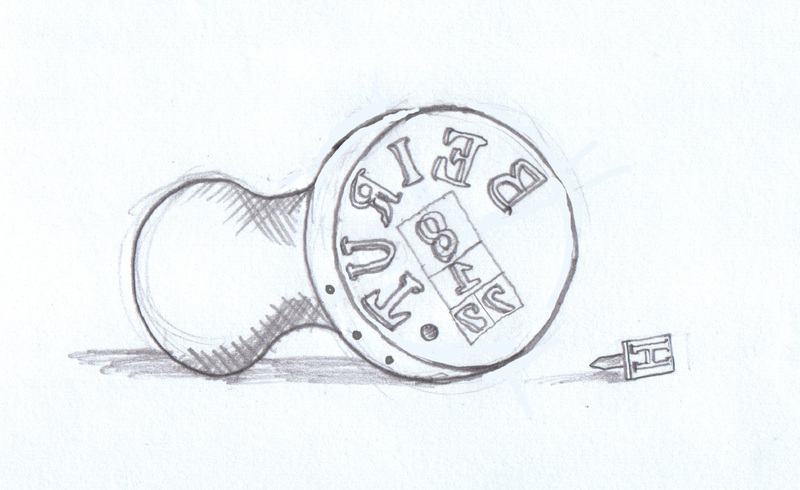 To talk about a particular cancellation of the Austrian Levant used in Beirut, it is necessary to start from a summary analysis of the postal seal and cancellations used by the foreign offices operating in the Lebanese city (Fig.1). It concerns precisely the wavering interpretation and representation, transcribed from the Arabic, of the toponym Beirut: بيروت . 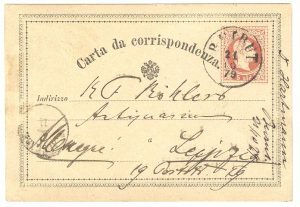 From 1845 the Austrian Lloyd agency used the Italian “BERUTTI”, characterized by Venetian assonance, while the consular post office started with the German “BEYRUT” in 1850, to make it uniform, returning in 1865, with the Italian-Venetian ” BERUTTI “. 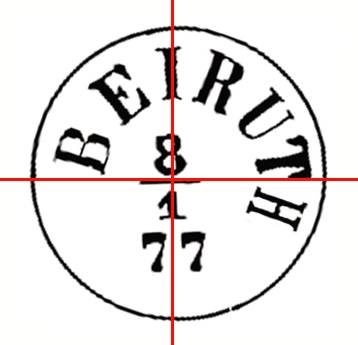 We then passed to the “BEIRUTH”, with the “H” final, in 1876 (but we will see to shed light on the real initial intent), to apparently arrive at “BEIRUT” in 1877, return to “BEIRUTH” always in 1877, and finally finish with “BEIRUT” from 1893 to 1914. 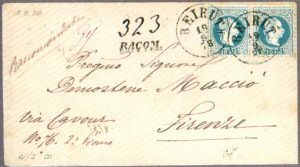 The French and English offices kept the transcription steady, respectively in “BEYROUTH” from 1845 (with an interlude without “H” from 1854 to 1866) and “BEYROUT” from 1873. 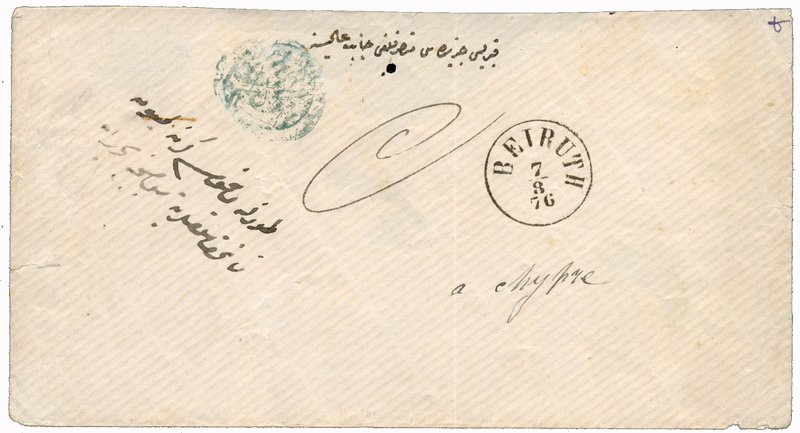 The Egyptian one from 1870, considering that in Arabic the vowels “e” and “o” do not exist, transcribe it phonetically literally in “BAIROUT”. 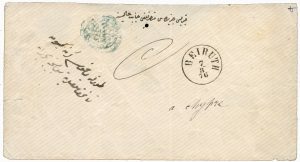 In the Russian post office, since 1857, the transcription “БЕИРУТЪ” was used constantly; it can be translated into “Beiruth”, keeping in mind that, in Cyrillic, the sign “Ъ” (the final “H”) does not correspond to a letter but to the hardened accentuation of the preceding one. The German office, since 1900, simply and constantly adopted the transcription “BEIRUT”. It should be remembered that all these post offices, except the Egyptian that closed in 1872, officially ended on 30 September 1914. 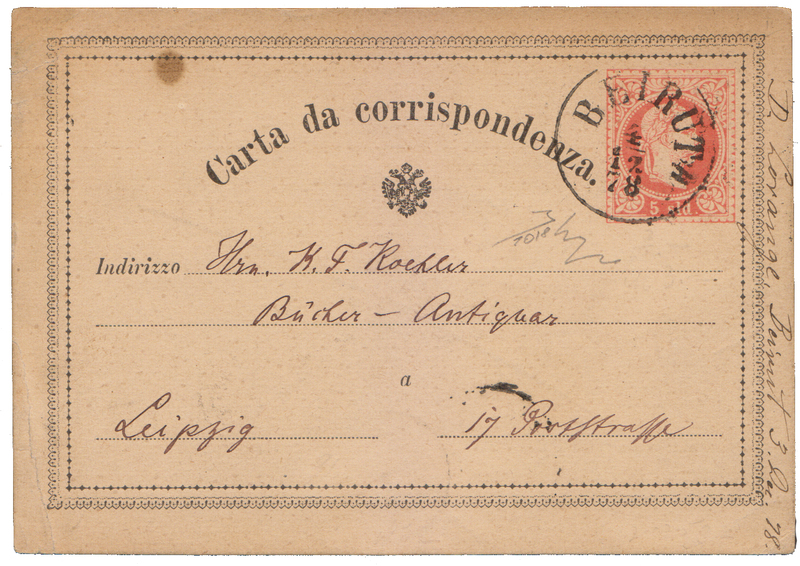 But we return to the cancellation, the one that the Austrian office started to use from 1876 (Fig.2). Unlike of the previous one, in the date also reported the year, and I do not think it was exclusively a dictation of the U.G.P. 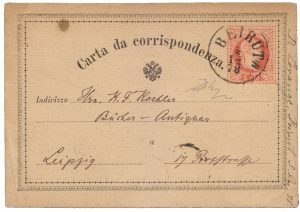 agreements, entered into force from 1 July 1875, but rather an adjustment, because in the offices of Constantinople and Alexandria their use is already known in 1874. Observing it, at first sight eye immediately catches an anomaly in the alignment of the fonts respect to the date and a disproportion between the width of the “H” and that of other fonts. 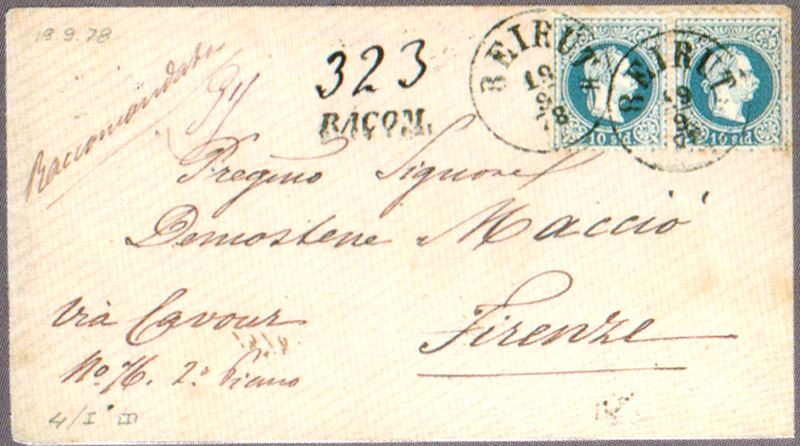 So far nothing exceptional, if it were not that, in two envelopes that I have see, the final “H” is incomplete, accentuating its disproportion with the other fonts, almost disappearing (Figs. 3, 4 and 5). Precisely “almost to disappear”; but in 1879 it disappeared really (Fig.6), so much so that the cancellation was set aside and rarely used and was replaced by a new type of “Bastoncino” fonts comprising the merited final “H”. I believe that the anomaly in the alignment is to be interpreted as a manipulation that took place when the work was finished. 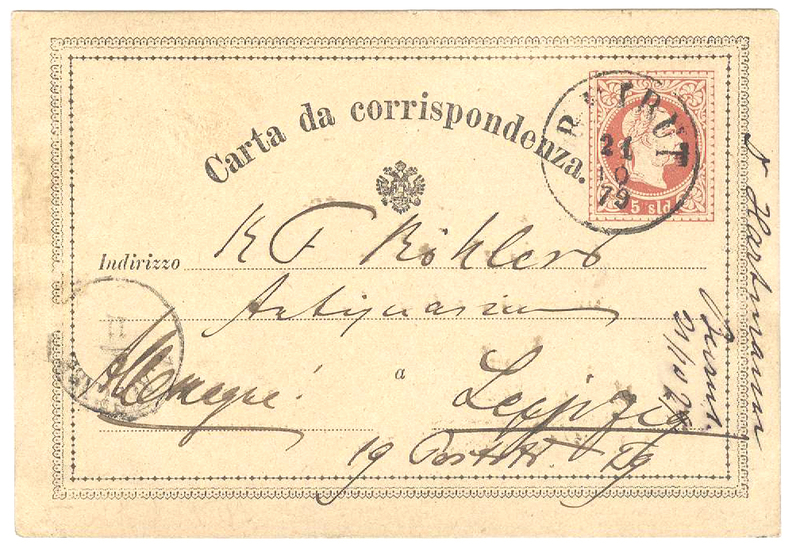 The postmark, in fact, was coined with the word BEIRUT well centered compared to the date that was mobile, but, for reasons I do not say anti Italians but maybe pan Austrian, at the last moment was given an order to add the final “H”. The addition, on the already finish steel part, probably occurred by nailing the “H” font (inserted in an hole caused) (Fig.7). This leads one to believe that the font was molten and worked in soft metal, so it could not withstand long the stresses inflicted by the Postmaster Joseph Berhaupt. 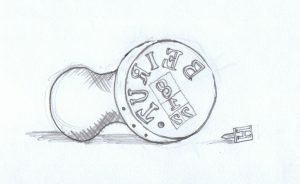 And what happened, that is the wear and detachment of the “H”, led the catalogs and collectors to consider it as a different type (as in reality it is from a certain date onwards). Very short and conclusive geopolitical note of the period: before the agreements of the Triple Alliance of 1882 (Germany, Austria and Italy), between Italy and Austria there was not good blood. Austria did not properly consider Italian unity, achieved in his opinion, politically and morally opportunistically; the irredentism of the cities of Trento and Trieste was also maturing, a thorn in the side of the Habsburgs, symptomatic of future events of war. Italy, in its turn, identified in the very Catholic Austria the old and new enemy from which to look, especially for its ostentatious support for the papal restoration project on the former territories of the church in central Italy regions. In short, the times of “Berutti” and the old Levant coats of arms, inherited from the “Serenissima” Republic of Venice, were ending; it was the period when Austria needed an “H”, even at the cost of nailing it.